How does back pain relate to cardiovascular disease and diabetes? What role does physical activity play? We spoke with Dr. Jeffrey Hebert about his research with back pain and other musculoskeletal disorders, which he hopes will have an impact on clinical practice in the future. Q: Tell me about the research you’re doing right now. A: We’re researching how musculoskeletal (MSK) disorders like back pain relate to other diseases like cardiovascular disease and diabetes. We’re asking ourselves if back pain can increase someone’s risk of developing other diseases as well as the role of physical activity in these relationships. In order to develop these conclusions, we’re studying two population groups: children/adolescents and adults aged 65+. Much of this work is being done in collaboration with our Danish colleagues in the Childhood Health, Activity, Motor Performance Study (CHAMPS) and the European Youth Heart Study. I’m extremely fortunate to work with a number of talented researchers with backgrounds in chiropractic, medicine, and epidemiology. Q: Why those two specific population groups? A: Each group offers different types of information. For example, adults aged 65+ have often already developed cardiovascular disease whereas children and adolescents can present with different risk factors for disease in the future. We recently completed a study of ~1000 children and discovered that girls with back pain have elevated cardiovascular disease risk factors such as insulin resistance compared to girls without back pain. Contrary to our hypotheses, physical inactivity does not totally explain the association between back pain and cardiovascular disease risk, and this relationship was not present in boys. As is often the case in research, we’ve ended up with more questions than answers. We will soon be starting a project to evaluate changes in cardiovascular disease risk in older patients who undergo surgical treatment for degenerative spinal stenosis. Q: Why are you looking at cardiovascular disease, in particular? A: As health researchers, we try and undertake research with the largest potential benefit to society. Cardiovascular disease is the largest cause of mortality worldwide, while back pain is the largest cause of disability. It is important to understand how these diseases relate to one another and attempt to identify what could be responsible for these links. We already know that a lack of physical activity is linked to cardiovascular disease and diabetes. We also know that many musculoskeletal diseases like spinal stenosis impact people’s ability to be physically active. I’m interested in whether MSK disorders are the gateway to developing more serious diseases. Q: How will your research make a difference for chiropractors? A: If we understand the link between MSK conditions and other serious health challenges, we’ll be in a better position to impact people’s lives. For example, a patient living with knee osteoarthritis may find it more difficult to be physically active. And effectively treating someone’s pain will not necessarily change their physical activity levels. In fact, health habits often remain unchanged despite improvements in pain and capacity. As chiropractors, if we solely focus on pain and disability, I think we’re missing opportunities to improve people’s lives long-term. Systematically inquiring about each patient’s physical activity and providing appropriate advice should become the standard of care for patients with MSK disorders. “Exercise is medicine” represents an important opportunity for chiropractors. I’m really excited about answering these research questions in a way that can inform clinical practice in the future. 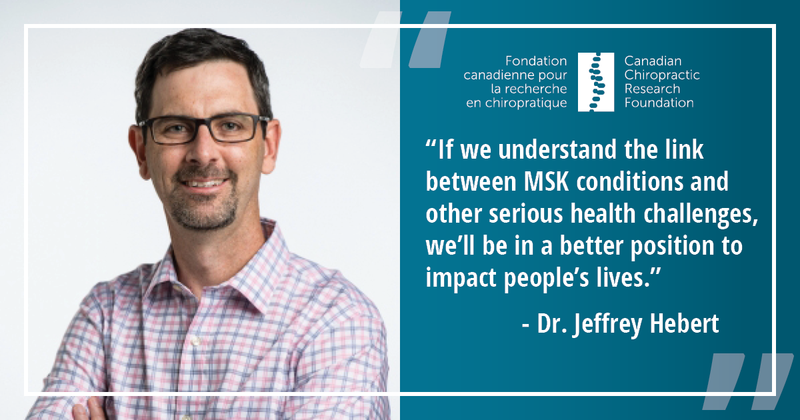 Dr. Jeffrey Hebert is the Research Chair in Musculoskeletal Health at the University of New Brunswick for the Canadian Chiropractic Research Foundation. He is also a full, tenured professor in the Faculty of Kinesiology at UNB.